Prepare your child for a solid education foundation! Smart Reader Kids® is the perfect place to develop children age 3 to 6 years to be inquisitive and intelligent. Smart Reader Kids® program is a kindergarten concept conceived to translate the potential of every child into achievements. By using creative methodology and well-researched materials, the learning process is fun and focused. This kindergarten program offers an imaginative educational experience for children that promotes joy, enthusiasm and creativity in early learning stage. It also helps to build children confidence and skills. The Smart Reader creative methodology is shared by educationalists locally and internationally with proven outstanding results. All of our teachers are well trained by our corporate trainers and lecturers. They are certified Smart Reader Kids® creative teachers. They continually introduce ways in communications and enhancing their skills by reading, combining ideas and experimenting to keep the class presentations lively and invigorating. 1. Specially design dedicated rooms and area that promotes fun learning. 2. Educational toys for kids to play during their break time. 3. Rooms are clean and fully air-conditioned, provides comfortable learning environment. 4. Our facilities are equipped with safety entrance features ensuring your child safety while with us. By joining us, your kids will be given high quality preschool educations and will be well developed before hand compared to their peers. 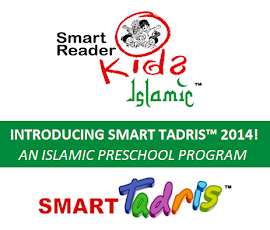 As for side benefits, Smart Reader Kids® preschooler is entitled for a Privilege Card at no extra cost. The monthly fees for Smart Reader Kids® prechool is RM295/month. Please contact us to learn more about Smart Reader Kids® preschool fee. 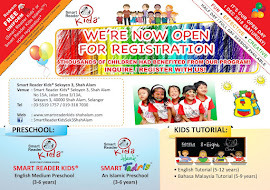 All in all, Smart Reader Kids®, Seksyen 3 Shah Alam is the "school" where every kid's dream can be realize. Register your child with us into the world of fun and effective knowledge development.